Every year during the last week of September, Utrecht is the Dutch capital of film. This is the time of the Netherlands Film Festival (NFF), and traditionally EFSP organises its own Unofficial Netherlands Film Star Postcard Festival. 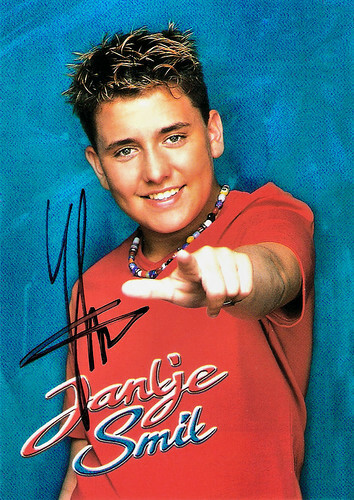 Today we present Dutch singer, television host and incidental actor Jan Smit (1985). His songs fall under the Dutch genre known as 'Palingsound' (Volendam music). 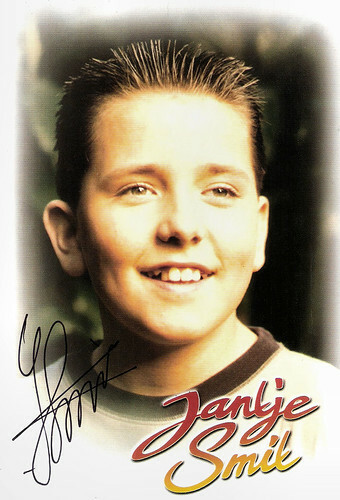 As a child, 'Jantje' Smit had success with his songs in Germany and other European countries. Smit also starred in the film Het Bombardement/The Bombardment (2014). German autograph card by Koch Universal, Planegg / München. Johannes Hendricus Maria (Jan) Smit was born in Volendam, The Netherlands, in 1985. His parents are Gerda and Ruud Smit. He has two sisters, Jenny Smit and pop singer Monique Smit. As a kid, Jantje sang for four years with the boys choir De zangertjes van Volendam. At the age of ten, he was discovered when the band BZN was looking for a young local talent who could sing a duet with BZN singer Carola Smit (no relation). Jantje was chosen and their number Mama was a great success. Following this success, he made a solo single record, Ik zing dit lied voor jou alleen (I sing this song for you alone) produced by three BZN members, Jan Keizer, Jack Veerman and Jan Tuijp. This single topped the Dutch charts. In the following two years, Jantje Smit scored five more hits including Pappie, waar blijf je nou (Daddy, where are you now). Jantje was also successful in Belgium, Germany, Austria, Italy and France. For some time, he often performed in Germany and he recorded ten German albums. In 2001 Smit and his BZN producers received the Dutch export price for the best-selling Dutch act abroad. At the age of 16, he left school to focus on his musical career. At 17, he changed his choice of music and started to work with the known song writers Cees Tol and Thomas Tol. A few years later he started to write by himself, together with good friend Simon Keizer, who later made name as a singer himself. Together with Nick Schilder, Simon forms a group named Nick & Simon. In 2005, the daily life of Jan Smit could be followed in the Dutch reality show Gewoon Jan Smit (Just Jan Smit). The program received that year the Golden Televizier Ring, a major television award in The Netherlands. He also started to present TV shows like Muziekfeest op het Plein (Music Party at the Square) and he scored hit after hit with songs like Laura. The popularity of Smit grew huge in the Netherlands. In 2006, Jan Smit was awarded the Edison Award as Best National Singer for his album Jansmit.com. In September 2006, a second series of Gewoon Jan Smit (Just Jan Smit) aired. In September 2006, C&A clothing store launched the collection J-style named after Jan Smit. Jan seemed to be everywhere. Dutch autograph card by Volendam Music, Volendam. German autograph card by Koch Music, Planegg / Munich. In the following years, Jan Smit continued to score number one hits and to present TV shows. In 2007, he won a TMF Award for Best Dutch Pop Act. In 2009 he released a duet with the Surinamese singer Damaru, Mi Rowsu (A little garden in my heart), which reached the number 1 position in both Suriname and the Netherlands. From 2011 on, he and Cornald Maas are the Dutch commentators for the Eurovision Song Contest, one of Europe’s biggest yearly TV events. Jan Smit starred in the film Het Bombardement/The Bombardment (Ate de Jong, 2014) with Roos van Erkel and Monic Hendrickx. The film, about the bombing of the city of Rotterdam in 1940 by the Nazis, was slashed by both critics and the public, but Smit was spared, his theme song went to no. 1 at the Dutch charts and the film still attracted more than 100,000 visitors. Since 2012 Smit presents the TV show De beste zangers van Nederland (The finest singers of the Netherlands). He also founded with his manager Jaap Buijs the record label Vosound Records. Artists who record for this label are his sister Monique Smit, Tim Douwsma and Gerard Joling. In 2011, he performed three nights at the Amsterdam Arena stadium during the concert series Toppers in Concert. In December 2013 Smit joined the board of soccer club FC Volendam. In 2014, he played a supporting role in the popular TV series Flikken Maastricht/Cops Maastricht (2007-) with Angela Schijf and Victor Reinier. With the Schlager group KLUBBB3 (including German singers Florian Silbereisen and Fleming Christoff), Smit tried to conquer the German market once more. Their debut album Vorsicht unzensiert! (Attention, not censured) reached number 4 to 6 in Germany, Austria and Belgium and was also recorded in the Netherlands and Switzerland. In 2017 the trio was awarded the prize Die Eins der Besten in the category Best Band of the year. Their second album Jetzt Geht's Los Richtig (Now it's time to get it right) entered at no. 1 in Germany, number two in Austria and number three in Switzerland. Their single Life Dances Sirtaki became a no. 1 hit in The Netherlands. In Germany Smit guest starred in the popular TV series Das Traumschiff/The Dream Boat (2017) with Heide Keller and Sascha Hehn. In 2017, Smit also joined the Dutch vocal band De Toppers, consisting of René Froger, Jeroen van der Boom and Gerard Joling. Since 2005, the band yearly gives a series of hugely successful outdoor concerts in the Amsterdam ArenA stadium. In 2011 and 2013 Smit was a guest artist during Toppers in Concert. Jan Smit had a relation with actress and presenter Yolanthe Cabau van Kasbergen from 2007 till 2009. Since 2009, Smit has a relation with Liza Shelf. The two were married in 2011 and they have three children. Trailer Het Bombardement/The Bombardment (Ate de Jong, 2014). Source: Dutch Film Works (YouTube). KLUBBB3 performs Das Leben tanzt Sirtaki. Source: ICH FIND SCHLAGER TOLL! (YouTube). Sources: Athena Dupont (IMDb), Wikipedia (English and Dutch), and IMDb.